Be the first to share your favorite memory, photo or story of Dr. H. Charles "Chuck". This memorial page is dedicated for family, friends and future generations to celebrate the life of their loved one. 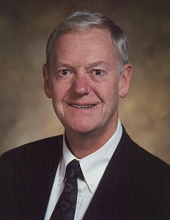 Dr. H. Charles “Chuck” Lindman, age 77, formerly of Sheboygan Falls, currently of Deerbrook, WI passed on Tuesday January 22, 2019 at Sharon S. Richardson Community Hospice in Sheboygan Falls. He was born October 14, 1941 in Milwaukee to Dr. Henry M.G. and Florence (Zipper) Lindman. He graduated from Marquette University High School, Class of 1959, attended Marquette University, Milton College and graduated with a Doctor of Optometry degree from Illinois College of Optometry in 1965. He married Judith R. Darrall at Holy Rosary Catholic Church in Milwaukee on June 22, 1963. He practiced optometry in Milwaukee from 1965 to 1968 and in Sheboygan Falls from 1968 to 2006. He was a past-member of the Sheboygan Falls Jaycees & Sheboygan Falls Lions Club. He spent many years on the Board of Appeals for the City of Sheboygan Falls and was active in the Lakeshore Optometric Society and the Wisconsin Optometric Association. He served as past-President of the Eye bank of Sheboygan County. He was a current member and volunteer of the Foley Railroad Museum and Caboose Club in Alabama and was currently Chairman of the Greater Bass Lake Protection and Rehabilitation District in WI. He enjoyed family, boating, water skiing, model trains, lake life, and laughter. In addition to his wife, Judith, Charles is survived by his three daughters: Laura Schultz, Dr. Sheryl (Thomas) Lindman Fischer both of Sheboygan; Julie (Patrick) Nelson of Longmont, Colorado; One son: Eric (Julie) Lindman of Plymouth; grandsons, Aaron Schultz of Sheboygan, WI; Nick (Emily) Roedel of Bay View, Van Nelson of Longmont, Colorado; Colton and Xander Lindman of Plymouth, Wisconsin; Alexandra and Stephanie Fischer of Sheboygan, WI. Also survived by his American Field Service (AFS) son Nicolas (Elisabeth) Nyhus of Oslo, Norway and his three daughters, and one sister: Patricia (Jim) McGrane of Appleton, WI. He was preceded in death by his parents and a baby brother and his in-laws, Ronald and Leota Darrall. Per his request, there will be no public visitation or services. Private family memorial services only. In lieu of flowers, please consider a contribution to either: Foley Railroad Museum Caboose Club: 125 E. Laurel Ave. Foley, AL 36535 or National Railroad Museum in Green Bay, WI. Thank you Dr. Chistopher Peterson and staff at Wausau and Antigo Aspirus Hospitals, and the wonderful Aspirus Med-Vac Team of Wausau. To send flowers or a remembrance gift to the family of Dr. H. Charles "Chuck" Lindman, please visit our Tribute Store. "Email Address" would like to share the life celebration of Dr. H. Charles "Chuck" Lindman. Click on the "link" to go to share a favorite memory or leave a condolence message for the family. memory of Dr. H. Charles "Chuck"